Context - In Europe, 12% of the population has tattoos, with a higher rate amongst young adults. The growing popularity of tattoos and permanent make-up (PMU) over the last years is confirmed by the large availability of products on-line. Hundreds of different colorants and additives are used in this process, are they safe? This is a faithful summary of the leading report produced in 2016 by the European Union (EU): " Safety of tattoos and permanent make-up"
Tattoos are largely spread, and the growth of popularity of tattoos has been accompanied by the growth of tattoo removal, which has its own risks. The inks used in tattoos contain several ingredients, as well as impurities. Tattoos applied by injecting coloured inks under the surface layer of the skin are meant to stay life long, thus resulting in long-term exposure to the chemicals that are injected, including their degradation products. Are there harmful ingredients in tattoo inks? More than 100 colorants and 100 additives are in use. The pigments used are not specifically produced for tattoo/permanent make-up applications and generally show low purity while the majority of them is not authorised for use in cosmetic products. Over 80% of the colorants in use are organic and more than 60% of them are azo-pigments, some of which can degrade to release aromatic amines classified as carcinogenic. This degradation may happen in the skin, particularly under solar/ultra violet radiation exposure, or laser irradiation, which is a technique used to remove the tattoos. What are the possible complications of tattoos and permanent makeup? In the absence of systematic data gathering, the actual prevalence of tattoo complications (mainly of dermatological nature) is currently unknown. Most of the complaints and documented complications are temporary and are due to the tattooing process itself, since the tattooed area is essentially an open wound and is susceptible to infections, either bacterial or viral. Acute allergy and delayed hypersensitivity prompted by e.g. the inks ingredients and tattoo/removal trauma, represent the bulk of tattoo/permanent make-up complications, affecting mostly the red or black parts of the tattoos. Such reactions are unpredictable and may sometimes appear after a long time, sometimes decades, giving rise to chronic sequels in connection with underlying auto-immune pathologies. People with certain medical conditions, like hemophilia, are strongly advised against getting tattoos. To ascertain the risk of carcinogenicity from tattoo inks constituents, including their degradation products, prospective epidemiological studies would be needed. As several adverse reactions linked to tattoo removal were registered in the last years, more studies on the techniques employed for tattoo removals and the development of tattoo pigments easier to be removed are also required. How are tattoos regulated in Europe? Currently, although there are general guidelines that have been put forth by the European Commission, each Member State of the EU regulates the safety of tattoos in their own way. Most countries have regulations requiring professional tattoo artists and studios to follow health and safety guidelines. In terms of ingredients found in inks, however, the regulations are still a bit more fuzzy, and in one of them, manufacturers are even not required to label their products with the various ingredients they contain. What is still lacking regarding risks management related to tattoos? There are still many data gaps mainly in terms of risk assessement of the dyes used in tatto inks. In the absence of such risk assessments, for azo pigments in particular, a precautionary approach would consist in not using those that contain aromatic amines classified as Carcinogenic, Mutagenic or Reprotoxic (CMR). In this context, market surveillance activities should be continued to identify hazardous products and be also carried out on products sold on-line and clandestine backyard tattooing should be stopped. Eventually, the preparation of harmonised hygiene guidelines also is highly recommended and periodic inspections of studios required. Market surveillance activities should be continued to identify hazardous products and be also carried out on products sold on-line and clandestine backyard tattooing should be stopped. What are the changes in labeling and risk communication that are needed? Risk perception is mainly based on the information given by tattooists, parents or friends, or read in mass media and internet. Among students, awareness about infectious risks seems to be higher that on non-infectious ones, but that knowledge is often only superficial. Based on the experience gained from implementing national laws and the Committee of Experts (CoE) Resolutions, experts agreed that an update of the chemical and labeling requirements would be desirable. In particular, the packaging size should be supplied for single use on an individual consumer. 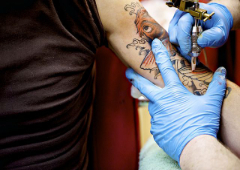 Tattoo and permanent make-up activities, including sterilisation and disinfection of the instruments, should be carried out by the tattooist in conformity with the hygiene regulations laid down by national public health service. The training of tattooists also should be compulsory and cover at least some key topics. More specifically, the packaging size should be supplied for single use on an individual consumer. Eventually, harmonised analytical methods for the analysis of tattoo/PMU inks should be developed to ensure reproducible results and allow a correct implementation of the chemical requirements of legislation in place.